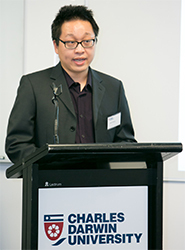 Amid the cacophony that attends Australia’s immigration and border control conversations, a Charles Darwin University (CDU) PhD graduate has rendered personal perspectives from a group of people who are most directly affected by Australian Government migration policies. Dr Daile Rung will receive her award tomorrow at CDU’s graduation ceremonies for a thesis titled “To Move and to Resettle: The Elusive Goals of Precarious Non-Citizens”. Using an alternative sociological method of inquiry called institutional ethnography and a recent political theory of human mobility called kinopolitics, her study explores how it has come to be that increasing numbers of people in Australia and around the world are experiencing long-term precarious lives as “non-citizens”. “I looked at human mobility and immobility, and government policies that inform the practises of enforcing border security, and how they have changed over time,” Dr Rung said. “My thesis speaks to how nation states decide who belongs in their societies and who doesn’t. Dr Rung said her approach to immigration policy raised important questions about social justice and human rights, and sought to bring an Australian context to the work of Canadian political scientist Joseph Carens, who writes extensively about the ethics of immigration. “I look at what it is to be a person in society in the sense of Carens’ assertion that ‘time (spent in a society) carries a moral force’, which means the longer someone spends in a place the more they contribute economically, and develop deep connections with their network of social attachments,” Dr Rung said. Dr Rung said it was not only migrants who were at risk of being considered “non-citizens” but that people who were born in a country also could be subject to the same socio-political characterisation. “Almost everyone I spoke to thought that if a person was born in Australia they were automatically regarded as a citizen but that isn’t necessarily the case,” she said.